Few places in this country can boast the attributes of Oregon’s North Coast. From the soaring views high atop the headlands down to the banks of the mighty Columbia River, from the densely forested park land to the wide open spans of beach, the quaintly chic small towns to the rural village vibe, this is a landscape that’s as varied as it is beautiful. The cherry on top, of course, is its thriving craft beer scene. Cannon Beach is world-famous for its spectacular oceanfront setting and the iconic Haystack Rock. It’s also home to the one-of-a-kind Cannon Beach Hardware and Public House, a combo retail store and restaurant in midtown where you can shop for a wrench while sipping on a Northwest microbrew. Or grab a seat and have a meal. A short cruise north on Hemlock Street brings you to Seasons Café, where all the fare is made fresh and the menu features six local brews on tap (with another six soon to come) and an expansive wine list. Lunch is all about paninis, soups, wraps and salads, while the dinner menu showcases owner Doug Brown’s pasta specialties, like the squid ink linguine with Steamer clams in a white wine and yellow curry broth, or spinach and cheese ravioli topped with Dungeness crab – a locals’ favorite. 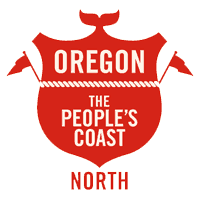 The kid- and dog-friendly Public Coast Brewing on 3rd Street celebrates Oregon’s free and public 363-mile coastline with easy-drinking ales and the motto, “Beaches forever. Beer for everyone.” Breathe in the salty air on the brewpub’s popular patio or gawk at the brewing process through the bar’s large windows. Either way you’ll be happy with a pint of Public Coast. Six miles up Highway 101 sits Seaside, a playful town known for its 1.5-mile oceanfront Promenade – the only one of its kind on the Oregon Coast – and wide, sandy beach. But unsuspecting visitors will also discover a happening beer scene that includes eclectic pubs and Seaside Brewing Company, a craft brewery located in the old city jail on Broadway Street. Beer aficionados and oenophiles alike will want to get off the beaten path and seek out one of Seaside’s drinking gems: the Wine and Beer Haus, which is hidden in the Seaside Factory Outlet Center. It isn’t everywhere that you can go shopping and find yourself in a store carrying 500 different bottled beers, as well as a large selection of wine and an invitation to dine. But that’s exactly what you’ll discover here. Owner Jeff Kilday doesn’t do any cooking, but rather invites you to indulge in the fare of neighboring cooks. When it’s time to dine, Dundee’s Bar and Grill, located in the heart of town on Broadway Street, features hand-battered halibut made with McTarnahan’s beer, brick-oven pizzas with dough made fresh daily and — you guessed it — a full-service bar. Sweet tooth calling? Finish with coffee and donuts at Dundee’s Donuts next door. 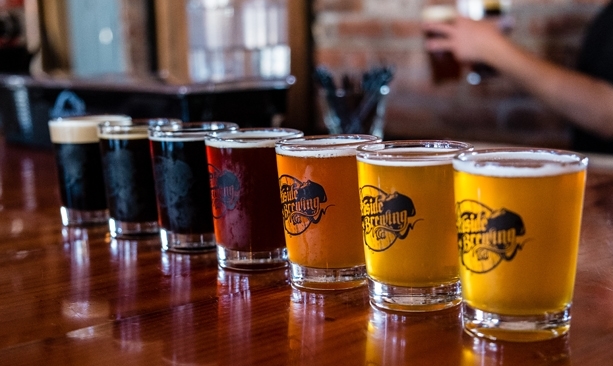 Set 17 miles north on the mighty Columbia River, Astoria is a storied port city noted for its history, culture and — in recent years — craft beer. 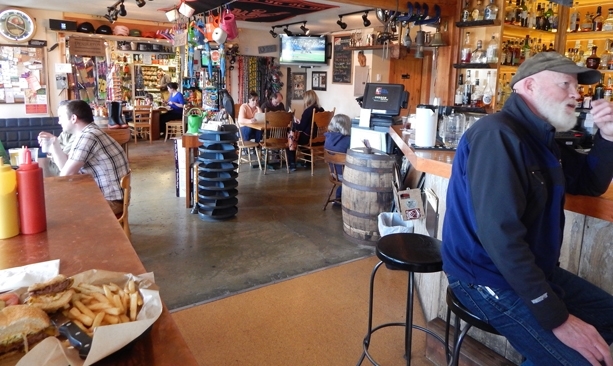 The Wet Dog Café & Brewery holds the title of Astoria’s oldest brewery; this waterfront pub was founded by Astoria Brewing Company, the oldest brewery operation in town. And while they’re known for their brews — like the Trolley Stop Stout and Old Red Beard Amber — they’re kid- friendly, too. Their menu includes starters, salads, burgers, seafood and brats. There’s even a patty for the pup. One of the newest additions to the Astoria pub scene is Buoy Beer, which just happens to be housed in one of the oldest settings on the banks of the mighty Columbia River. And, wow, what a stunning view! Of course the setting is only part of the reason locals flock here. 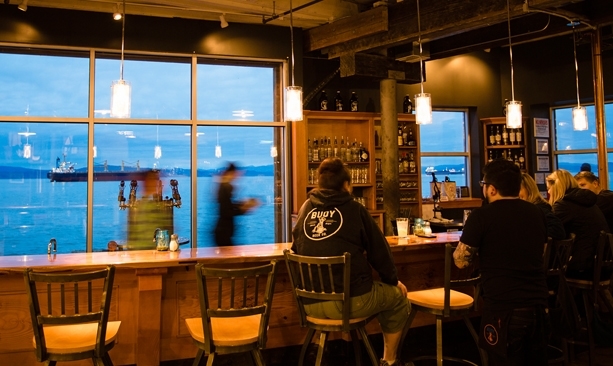 The brewery specializes in balanced northwest ales and traditional lagers, while the pub menu centers around local seafood with unique offerings like buoy oysters, pan-fried with jalapeno jelly and goat cheese pearls.